The all new NS15 (New Summa) has an all new 15" high performance Neo woofer and a 18" waveguide with a Neo compression driver. The enclosure construction is unique, made entirely out of composite plastic with a high-tech ultra-flat finish. This is a large speaker, but it reigns supreme in performance. Below are shown data plots (ERB (Moore) smoothing). This is the the horizontal polar response. On the lower left is a polar map which shows sound levels as a contour map in 6 dB increments. The vertical axis represents the angle in degrees and the horizontal axis represents frequency. These polar maps represent the best source of loudspeaker response data available. From about 80 Hz to well over 10 kHz and from the axis out to almost 30° the response is uniform within a few dB - a remarkable feat. 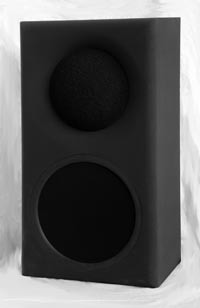 This is a closed box design and is intended	to be used with multiple subs, however, ported designs are possible for extended low end should the use of multiple subs (highly recommended) not be desirable. Size: 35" x 19" x 13"